Leather can be molded into nearly any shape if you first soak it in water then hold it in the mold until the leather dries. The result will be a hardened piece of leather molded to your specific shape. A leather mold must be water resistant, and sufficiently strong to have the leather stretched across it to form the right shape. Soak the leather in cold water until it becomes pliable enough to wrap around your mold. Depending on the thickness of your leather pieces, this may be from 15 minutes to several hours. Test the leather periodically and refresh the water as necessary. Cut your cardboard into the shape you wish to mold out of leather. For example, if you wish to make a leather case for your cell phone or mp3 player, cut out pieces of cardboard with the outline of your device until you have enough to match the device's thickness. Wrap the pieces of cardboard in tape so they don't fall apart when you apply the wet leather. Stretch the leather over the mold. If you are making a device case, you can stretch one side and press down around the edges to match the corner of the device. Then put the stretched piece of leather on the bottom and stretch another piece over the top, pressing down around the edges again. Tack the leather in place until it dries--usually in 24 hours. Remove the mold from between the pieces of leather. If you are making a device case, you can punch holes around the edge with an awl--about every 1/4 inch--then stitch the pieces together with thread. 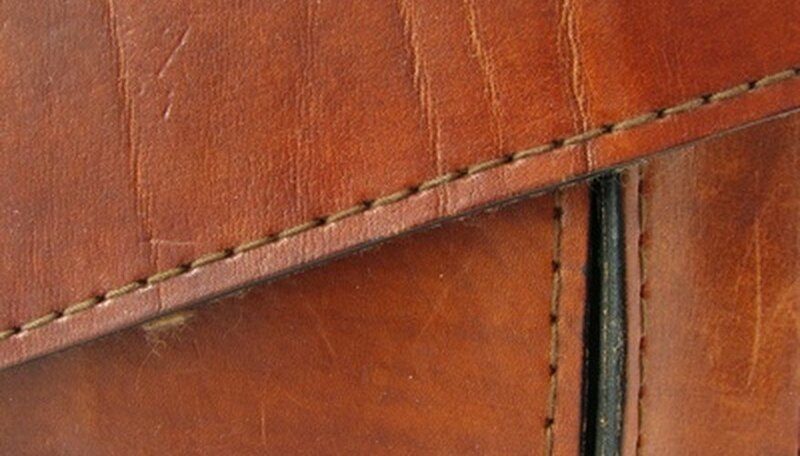 Double stitch the leather to create a more durable finished product. Cut off the excess leather and use wax to polish the leather until it shines.